San Juan County Commissioner Rebecca Benally testified to this fact in a Congressional hearing last September. In her testimony she asserted that not only were the FCM and BLM accounts of looting inaccurate, but that a federal designation would actually increase vandalism and looting due to a massive upswing in tourist traffic. 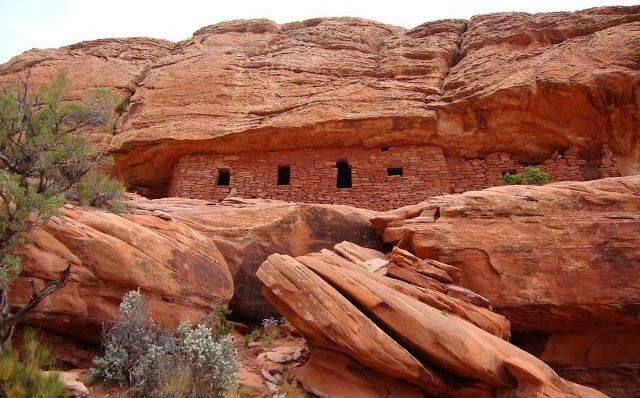 Alarmist stories about widespread looting and vandalism of Native American ruins were used in a media campaign to promote the designation of the Bears Ears region of southeastern Utah as a national monument. Despite the fact that neither President Obama nor his outdoor recreation big wig Interior Secretary, Sally Jewell, have any qualms about nationalizing lands, the extreme special interest groups pushing for the designation needed a sympathetic cover story. So, the Friends of Cedar Mesa (FCM), with the help of the Bureau of Land Management (BLM), propagated fake news stories about mass looting on Cedar Mesa, an area where numerous ancient Indian ruins are found. BLM collusion with special interest groups comes as no surprise to the people of Southern Utah, who have been battling well-funded land-grabbing organizations such as FCM, Grand Canyon Trust and Southern Utah Wilderness Alliance for decades. Not only are these groups primarily populated by folks from outside of Utah, but there is a body of evidence proving they will use unethical and dishonest means to achieve their shared goals. With the help of the BLM, environmental groups have gotten away with reporting all kinds of unsubstantiated claims. Stories of mass looting on Cedar Mesa are just one of several instances of fake news spread by Utah’s radical environmentalist factions. To magnify the impact of fake news about ‘widespread looting,’ FCM coordinated with the BLM and offered a bounty for information leading to the conviction of anyone caught looting or committing acts of vandalism in the archaeological sites on Cedar Mesa. This fake news was spread by mainstream media as well as radical environmental news sources. “Such incidents have become all too familiar in Utah’s San Juan County, which has more archaeological sites per square mile than any other U.S. county, totaling about 250,000. Federal officials fear looting is on the rise, with at least 25 incidents reported to the Bureau of Land Management’s Monticello field office since 2011. Media reports claimed there were 25 incidents of looting from 2011 to 2016. Utah’s acting BLM Director, Jenna Whitlock, also jumped on the fake news bandwagon. The problem with these assertions is that that the BLM’s own records don’t support reports of mass looting. The vandalism cases stemmed from holes being dug by some unknown source (badgers are common in the region) and foot prints of people walking around at different archaeological sites. From 2011 to 2016 the BLM reported a total of 30 incidents of vandalism. The only case in which a citation was issued dealt with someone picking up pottery shards (which may quite innocent given that pottery shards litter the ground in some areas and visitors pick them up to avoid stepping on them). These instances comprise the total cases reported during that period. And keep in mind that most people folks would not consider foot prints in the dirt to be vandalism, nor picking up shards of pottery to be looting. This reveals a systematic hyper-vigilance and overreaction to dubious cases of ‘looting’ and ‘vandalism’ in the Native American ruins in San Juan County, which, if data from pro-monument news outlets and special interests are correct, appear to be quite rare. The Salt Lake Tribune purported that there were roughly 250,000 archaeological sites in San Juan County and there were 25 case of looting and vandalism reported in a 5-year period. If their assertions are accurate it means instances of ‘vandalism’ and ‘looting’ are extremely low. According to data reported by BLM, FCM and the Salt Lake Tribune; 25 cases of ‘looting’ and ‘vandalism’ over a 5-year period equates to only .0001% of 250,000 sites being affected. It’s clear to honest observers that hysterical narratives perpetrated by Bears Ears monument supporters of widespread looting, destruction, and mayhem add up to nothing more than, well, fake news. San Juan County Commissioner Rebecca Benally testified to this fact in a Congressional hearing last September. In her testimony she asserted that not only were the FCM and BLM accounts of looting inaccurate, but that a federal designation of Bears Ears as a national monument would actually increase vandalism and looting due to a massive surge in tourist traffic. The numbers don’t add up to mass looting by any standard. The Friends of Cedar Mesa and the Bureau of Land Management intentionally fabricated the looting claims to manipulate public opinion and to give President Obama, and his eager land-gobbling Interior chief, cover as they furthered their quest to lock up natural resources and to secure their narrow and self-serving claims to the lands that belong to Utah’s people.